This TaylorMade Raylor Hybrid picks your golf ball out of the rough like no other. The shape of the head is specifically designed to get through the long stuff and launch your ball high and long. The leading edge is pointed, and the clubhead is very compact. In addition, the center of gravity is very low, which is what helps the ball fly high at impact. My only complaint about the club is it only comes in two lofts. 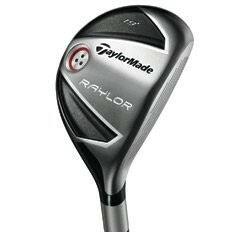 TaylorMade could do themselves (and us) a huge favor by offering this club in a lower loft for those of us who want to add a club with a more penetrating ball flight. Currently, you can only get it in 19 and 22 degree lofts. For a more workable option, take a look at the Titleist 909 H Hybrid and Mizuno MP CLK Hybrid.